2. I will once again be paying for summer uniform polos for rookie band members. I need your size before school is out. Veterans who need a replacement shirt need to let me know ASAP. Replacement shirts are $25. Work on filling out your summer uniform with a pair of all-black shorts, white socks, and white-ish tennis shoes. Please do not buy a new pair of shoes if you have anything that is not completely black. I am very reasonable about summer uniform shoes. 3. Take your instrument home and start working through your marching band music. It will be in your best interest to have your fight song and SSB memorized before rehearsals start. All show music will need to be memorized eventually so get started early if you are able! 4. Don't worry about ordering drillmaster shoes until after pre-camp. I will have more information available then. They are approximately $30. 5. Band camp scholarship recipients will be notified by phone or email after May 30. All band members need to have at least $50 (preferably $100) in their account before June 1. The balance of the $260 must be paid no later than band camp check in on July 14. No exceptions. Payments may be made at any time after July 14 in the booster mailbox. Make all checks and money orders payable to Fairbanks Music Boosters. 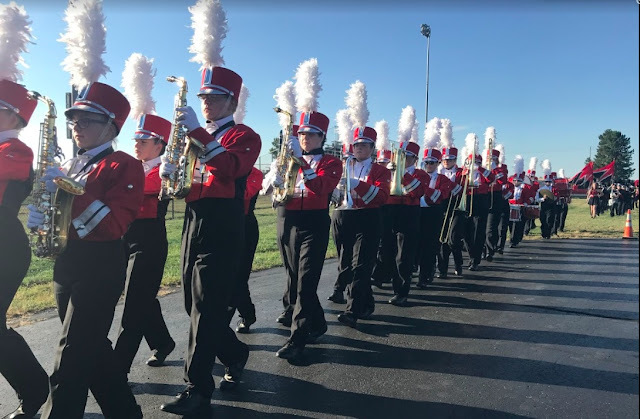 The $260 fee includes six days and five nights of camp, 3 daily all-you-can-eat meals, supervision, instruction, social events, DCI ticket, and FMB tshirt. It's quite a bargain, actually. 6. The Union County Fair Parade has been moved to Sunday, July 20 at 4pm. We will meet on the courthouse lawn at 3:15pm to prepare. Dress is summer uniform. Music is "Victors." 7. Pre-camp begins with rookie camp 8-noon for first year members and squad leaders on July 14. The full band will rehearse 8-nonn July 15-18. Come prepared with your music, instrument, sunscreen, sunglasses, water bottle, athletic shoes and socks. 8. Band camp begins on July 27 at Ohio Wesleyan University. Details on the week can be found on the band camp post. The room list will be open starting on July 15 and will be finalized on July 18.